One can always find interesting things to photograph on the Oregon Coast at all times of the day (or night). There were some very nice altocumulus clouds on this warm afternoon a week ago. 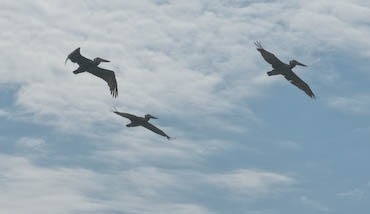 As soon as we hit the beach we were greeted by pelicans, landing a short distance from us. Although the back lighting was not ideal for bird portraits, it's always a pleasure to see them return to our beaches in late Spring. I decided to to a bit of split toning on this photo of the stacks at the end of the beach to bring out the sky and shadow contrast in this rather bright and somewhat harsh light. I used some of the great tools in Adobe Lightroom. 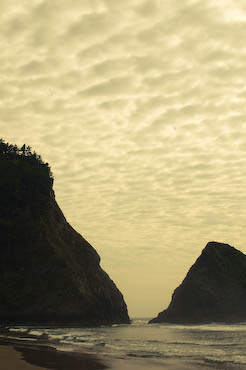 Near the sea stacks is Arch Cape Creek. Salmon can be found here, running in when the tide is high. 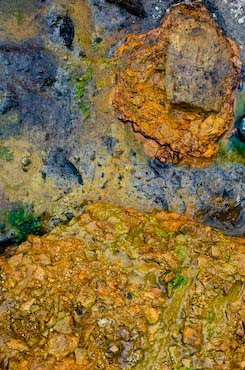 There is some interesting colors in the rocks and clay near the creek which makes for some abstract possibilities.